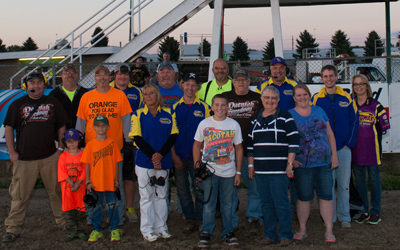 The checkered flag waved over the 2014 season at the Dacotah Speedway in Mandan on Friday, August 29th. It was a season full of close, side by side racing, first time winners and the occasional caution here and there. For the final time, fans packed the stands to watch their drivers have one last shot at victory. Nic West stormed to the lead in the IMCA Sport Compact feature. Behind him, Kody Stoxen and points leader Josh Roehrich battled hard for second place. While racing for second, Stoxen and Roehrich ran down leader West and it became a three car battle for the lead. Stoxen shuffled to the lead as Roehrich was all over West's bumper for second. With three laps to go, Roehrich passed West for second and challenged Stoxen for the feature victory. They raced side by side with two laps to go but as they crossed the Open Road Honda finish line, Stoxen held off Roehrich for the feature win, his third of the year. Nic West, who led early, finished third ahead of Chance Seelye and Michelle Stoxen. 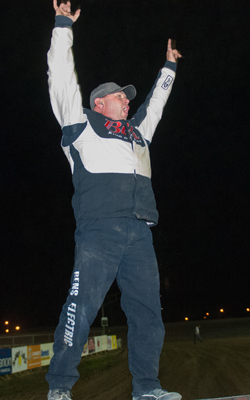 Roehrich's second place finish clinched his first track championship over Stoxen. Roy Erickson stole the lead from pole sitter Keith McCleary in the final Hobby Stock feature of the season. Second place Wyatt Rath-Wald had his hands full with a strong Chad Hausauer in third. They briefly battled for second before Hausauer motored by on lap three. Erickson's lead quickly disappeared as Hausauer was all over his rear bumper and into the lead by lap five. A lap seven caution gave track championship contender Jeremy Engelhard the opportunity to pit for a flat tire. On the restart, Engelhardt stormed to the front to battle Nathan Messer and Rath-Wald for fourth and fifth. Coming off turn four and racing to the checkered flag, Messer made contact with Rath-Wald and Engelhardt, sending his car off the frontstetch. Messer, who was running fourth, crossed the finish line behind fifth place Rath-Wald and fourth place Engelhardt. 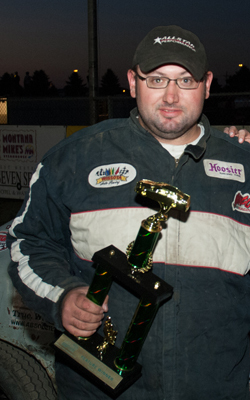 Jaren Wald made a last lap pass on points leader Brent Vetter to finish second behind feature winner Chad Hausauer. 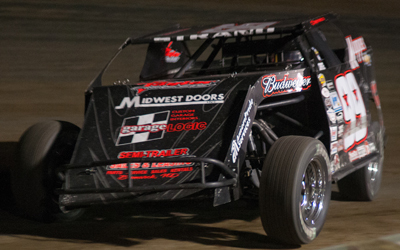 It was Hausauer's fourth victory of the season while Vetter locked up his first track championship at Dacotah Speedway. 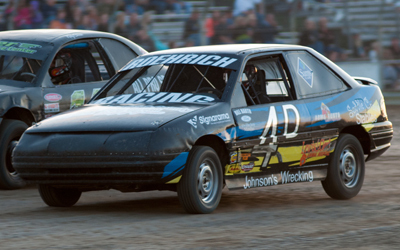 Jamestown's Josh Ganser and Dustin Frank raced side by side for the WISSOTA Street Stock feature. Frank led the first lap but Ganser was all over his rear bumper. A red flag on lap eight temporarily stopped the field when track championship contender John Feist rolled his car in turns three and four. Feist was ok but his season was unfortunately cut short. On the restart, Ganser had his hands full holding off a fast Travis Ulmer. They battled for several laps before Ulmer took the second position with 10 laps to go. Ganser rallied back but over drove turn four and fell from third to ninth. A caution with six laps to g o reset the field and on the restart, Frank and Ulmer raced side by side for the lead. Ulmer dove low under Frank but Frank's high line gave him the momentum to hang onto the lead. As the white flag waved, Frank and Ulmer were door to door for the lead. 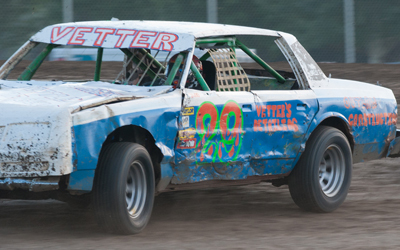 Racing down the backstretch, Ulmer threw his car into the corners three and four but got loose and spun. Dustin Frank led all 20 laps to win his first ever feature victory. Jamestown's Dustin Erickson finished second ahead of Shawn Volk, Josh Ganser and Matt Dosch. Eric Paul's 11th place finish wrapped up the track championship over David Falkenstein. Nate Keena and Loren Anderson led the field to the green flag in the INEX Legends feature. Trouble struck early as third place Anthony Kopp and fourth place Paul Morman made contact, sending Morman's car barrel rolling off the backstretch. Morman was fine but all that remained of his race car was the roll cage. On the restart, caution struck again, resetting the field once more. Keena led the field back to the green flag but it was Steven Kuntz who blew by Keena and into the lead before the third caution slowed the pace once more. During the caution, Kuntz's car fell under power due to an electrical problem and ended his night early. 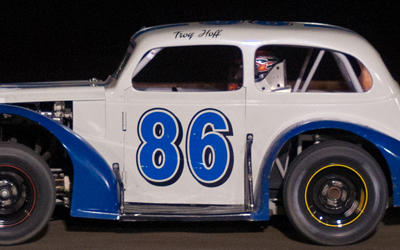 On the restart, Troy Hoff inherited the lead but had his hands full holding off points leader Donavin Wiest and Shane Williams. Wiest and Williams battled for second while Tom Wagner lurked in fourth. Williams shuffled into the second position as Wiest fell into the clutches of fourth placeWagner. Williams quickly chased down leader Hoff. The leaders took the white flag and Williams dove low under Hoff however, Hoff's high line prevailed and just narrowly edged Williams to the Open Road Honda finish line. 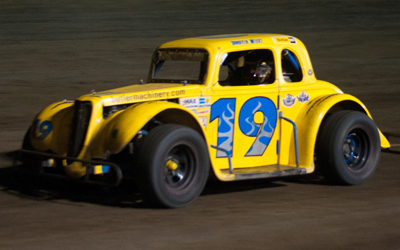 Tom Wagner slipped by Donavin Wiest with two laps to go but Wiest's fourth place finish was enough to lock up his sixth track championship in a row at the Dacotah Speedway. Rookie Andrew Jochim held off Preston Martin for fifth. Two points. 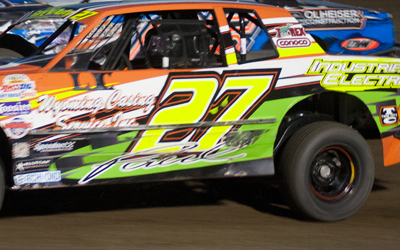 That was all that separated points leader Spenc er Wilson from second place Shawn Strand in the IMCA Modifieds. 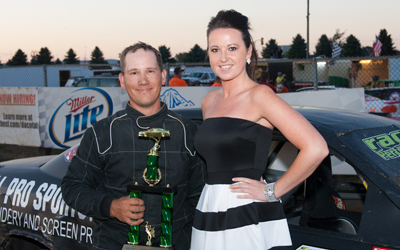 Brad Hanson led early in the final feature of the year. Hanson held onto his lead during a series of quick cautions but on the lap three restart, Drew Christianson and Travis Ulmer split Hanson for the lead. Christianson shuffled into the lead as Strand powered into second place. Christianson and Strand raced side by side for the lead as Mark Dahl and Spencer Wilson passed Ulmer for third and fourth. Strand would win the battle over Christianson and take the lead on lap six. As Strand pulled away, Dahl started to close in on second place Christianson. Lapped traffic played a factor as it appeared Dahl had the faster car but just could not clear Christianson for second. With the track championship on the line, fourth place Wilson started to close in on Christianson and Dahl. With three laps to go, Wilson dove low under Dahl and they raced side by side for third. Coming out of turn four and to the checkered flag, Dahl got loose which allowed Wilson to finish third, behind Christianson and feature winner Shawn Strand. Donald Robinson, who started 12th finished fifth. 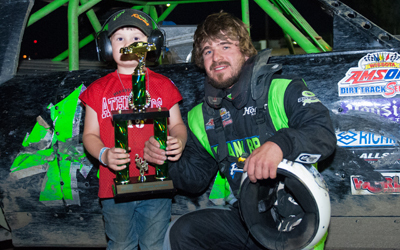 Strand's feature win, his third of the year, was enough to tie Wilson for the track championship. But using Strand's three feature wins as a tie breaker the track championship of the Modifieds goes to the #99. 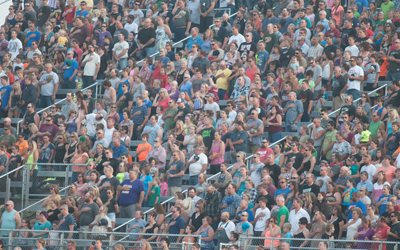 Thank you to all the fans who braved the hot, the cold, the windy, the humid and sometimes wet weather week after week, we appreciate your loyalty and love for racing. Thank you to all the drivers who drive long distances just to race on our 3/8th mile track, you put on a great show each and every week. Thank you to all of the track volunteers and track officials, without you, racing would not happen. From everyone at the Dacotah Speedway, thank you for making 2014 one of our biggest and greatest seasons yet and we hope to see you next year!